MonoDAQ 1xACC EtherCAT measurement modules are often used in pressure measurement applications on large industrial piping systems. 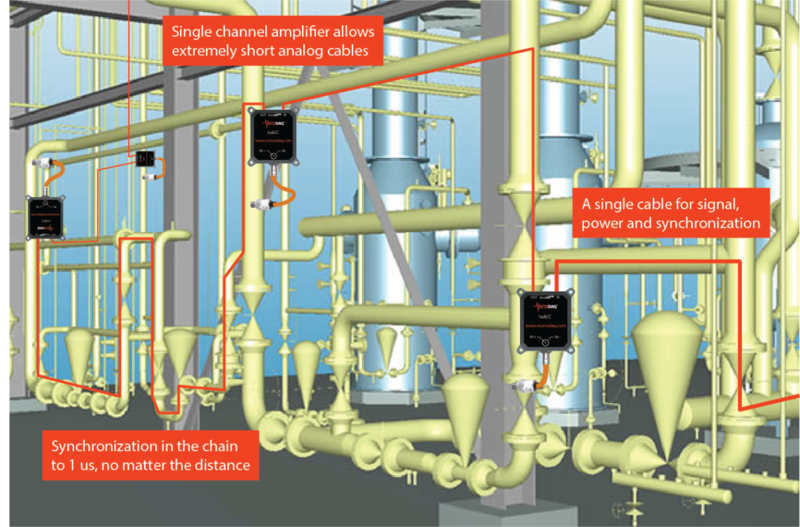 High pressure piping requires precise absolute pressure measurement as well as the ability to record fast transients. Peaks in pipe pressure can ultimately cause valve or joint failures, therefore the pressure needs to be closely monitored. The biggest challenge of such a measurement project is to record the data from multiple distant locations synchronously. One solution is to distribute sensor all over the building and wire the analog signals to a central data acquisition systems. Kilometres of analog cabling are expensive, or the cables pick up noise from the environment if the quality of shielding is not sufficient. The alternative is to also distribute the data acquisition devices and MonoDAQ single channel EtherCAT measurement modules are a perfect fit for such applications. The analog signal is conditioned and converted to digital code close to the sensor and the only cable connecting the modules is a simple network cable. Thanks to the EtherCAT distributed clocks protocol the devices are synchronized down to 1 microsecond – no matter the distance between them. The MonoDAQ devices also transmit power over the same network cable, which makes the wiring extremely simple, just daisy-chaining the cable from device to device.